January 2017 - Sew Memories welcomes Juanita Weaver, in her new position as primary contact and team manager. We are honored to have Juanita, who loves to sew, and has been working with our Sew Memories team for some years. We are grateful for her creativity, compassion, kindness,and expertise! We've experienced many losses in our lives: parents, friends, grandparents, grandchildren. We are also familiar with the comfort of memorial keepsakes sewed from their loved clothing. Adam and I have been married for 7 years now. But prior to that, his beloved wife of 25 years passed away. Some of her well-loved clothes were made into Memory Bears for the family by a creative and generous neighbor. These wonderful Bears have been a comforting presence for Adam and the kids ever since. And we also enjoyed similar keepsakes created with well worn and loved uniforms and scrubs (make great retirement gifts! ), outgrown t-shirts and sweatshirts (great graduation gifts! ), baby blankets and maternity clothes (sweet baby or wedding shower items!). Our daughters were always borrowing the warming pillows from our bed, until they gave us favorite t-shirts to make into their own warming pillows. 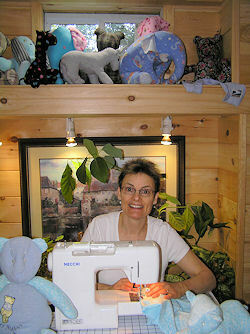 Now, all of us at Sew Memories help craft your Memory Bears and other treasured keepsakes. We love creating, and sew each keepsake tenderly and prayerfully.